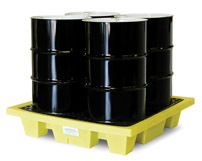 Protect the environment with this new design 2 Drum Spill-Pallet. 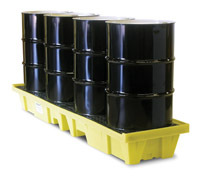 The remake of a classic design, this new 2 Drum Poly-SpillPallet is fully nestable for efficient shipping and storage. It features textured grates as a secure surface for drums to sit on. Grates are removable for easy access to the sump for cleaning. Heavy duty construction supplies excellent chemical resistance and can meet the rigors of any job site, making it a valuable addition to your containment lineup. Fully nestable design saves on freight and takes up less warehouse space. 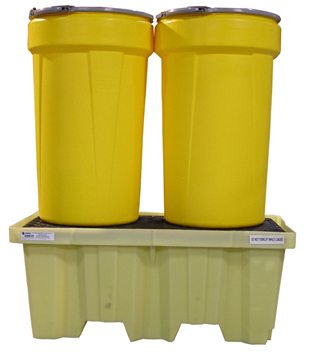 These pallets link together to form a cohesive, unobtrusive containment area when multiple units are required. Durable plastic design will not rust or corrode. 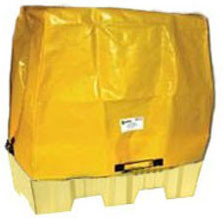 Optional tarp to prevent rainwater intrusion.